President Barack Obama is picking Michigan State to win the NCAA men’s basketball championship over defending champion Louisville. In what has become an annual March Madness tradition at the White House, Obama filled out a bracket in a segment broadcast on ESPN Wednesday. Obama predicted Michigan State will beat Florida in one of the Final Four semifinals, while Louisville — the tournament’s defending champion — will beat Arizona in the other semifinal. 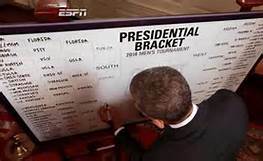 It’s the sixth straight year that the president has participated in what ESPN calls “Barack-etology.” Obama has correctly predicted the men’s tournament winner only once, North Carolina in 2009. And, as National Journal pointed out, Obama has correctly picked only four of the 20 Final Four teams in the five previous years. The President has picked three different teams in the “Barack-etology” era to win the men’s title — Indiana (over Louisville in 2013), Kansas (over Ohio State in 2011 and Kentucky in 2010) and North Carolina (over Kentucky in 2012 and Louisville in 2009). His correctly picked national champion was the Tar Heels in ’09. Last year Obama’s men’s bracket ranked 2,080,996 out of 8.15 million entries in ESPN.com’s free ESPN Men’s Tournament Challenge, placing him in the 74.4th percentile. President Obama has already filled out his bracket, have you?